Commissioned by the Trustees of the Silver Trust in memory of Jean Muir, C.B.E., F.C.S.D. (1928-1995), a founder Trustee of the Silver Trust. Toby Russell trained silversmithing and metalwork at the Camberwell School of Art and Design in London, graduating in 1986. Having set up his workshop in London his initially worked in pewter, with many of his early commissions undertaken in this medium. Toby’s work is to be seen in a number of collections in the United Kingdom and abroad. In 1989 Winchester College commissioned a memorial trophy from him. 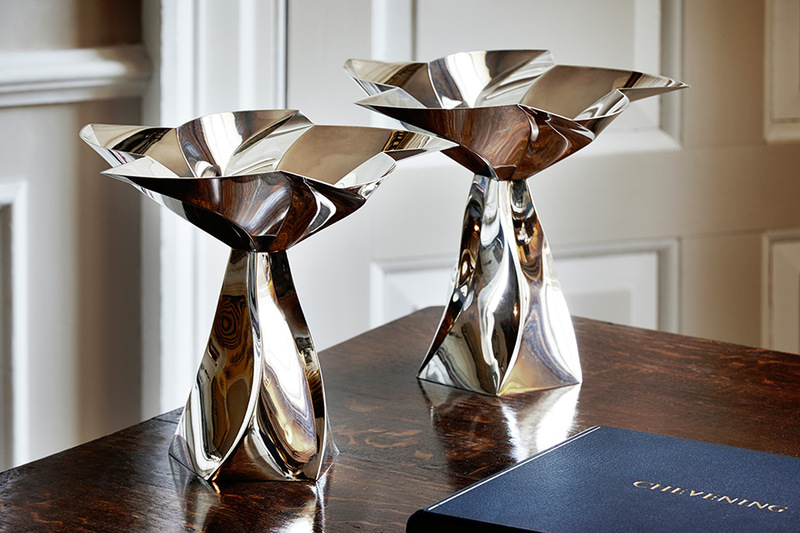 In 1992 he was commissioned by the Goldsmiths’ Company to design and make a silver vase for their Modern Plate Collection. He went on in 1993 to win first prize in The Goldsmiths’ Craft Council design competition and was awarded the prestigious Goldsmiths’ Company Award. He is a Freeman of the Goldsmiths’ Company. In 1999, Toby Russell was one of four silversmiths commissioned by the Goldsmiths’ Company for their Millennium commissions.